Disabled drivers are likely to have more difficulty than most other drivers when it comes to finding the right car insurance. Generally, disabled driver car insurance options are far more limited due to various conditions and risks that the insurance providers have to assess. Despite legislation against discrimination these difficulties persist for disabled drivers looking for car insurance. For example, some disabled drivers will have needed to modify their vehicle in some way to make driving better suited to their needs. However, some car insurance providers will still see modifications as a risk factor — a change to the vehicle, making it harder to assess for risks. In some cases modifications are still part of a legacy associated with the stereotypical ‘boy racer’, which means any modifications for usability purposes may not always be seen that way by all of the car insurance providers. Car insurance for disabled drivers has more limitations than most other types of car insurance policy, but that does not mean disabled drivers can't get a good deal. In fact, disabled drivers, statistically speaking, are often seen by insurers to be safer drivers and thus pose less of a risk. In addition to this, disabled drivers make up around 6% of all licensed drivers in the UK. The car insurance market isn't just legally bound to offer similar deals to avoid being charged with discrimination; it is also in their commercial interests to keep prices competitive for disabled drivers comparing car insurance policies. There are also some insurers that specialise in car insurance for disabled drivers, so you could find a good deal by shopping around. Before you compare disabled driver car insurance there are a few things to be aware of that could help you get the best deals and increase your options when searching on car insurance comparison sites. As a rule, all drivers need to notify the Driver and Vehicle Licensing Agency (DVLA) of any medical conditions or disabilities they have that could impact their driving. They also need to inform the DVLA if those medical conditions or disabilities get worse. Bearing this in mind, if you are a disabled driver, ensure that your driving licence information is up to date and that the DVLA are aware of any notifiable medical conditions and disabilities you have. This will make it easier to accurately assess what type of cover might be needed. For example, if your disability meant you had to modify your car in order to use it properly and a car accident rendered the vehicle useless, would your insurance provide you with a replacement car with the same modification already installed? When comparing car insurance on comparison sites, be sure to fully complete the section on car modifications. As mentioned previously, insurers think of any modification as an additional risk, but if they are aware it is for usability purposes, this could significantly alter the cost you are quoted. It's also worth noting that the Disability Discrimination Act 2005 makes it illegal for insurers to refuse you cover on the grounds of your disability. Similarly, car insurance providers are not allowed to discriminate by charging disabled drivers higher premiums. So although there may not be as many car insurance options available for disabled drivers, it is against the law for you to be quoted a more expensive deal. Ultimately, it is important to shop around and see what car insurance deals are available, and what type of cover you can get for a price that is right for you. However, if you are finding that disabled driver car insurance is still too expensive, you could consider signing up to the Motability scheme (read more about this further down). When comparing car insurance for disabled drivers you will need to check what exactly is covered in the policy. For example, if it is a car that carries wheelchairs, or has been adapted to have a hoist or ramp, hand controls or swivel sweats, will those aspects and modifications be covered? Will a replacement car be provided in the event of theft or severe damage? Will the modification for usability be replaced too? Is the modification specifically insured in case it gets damaged? 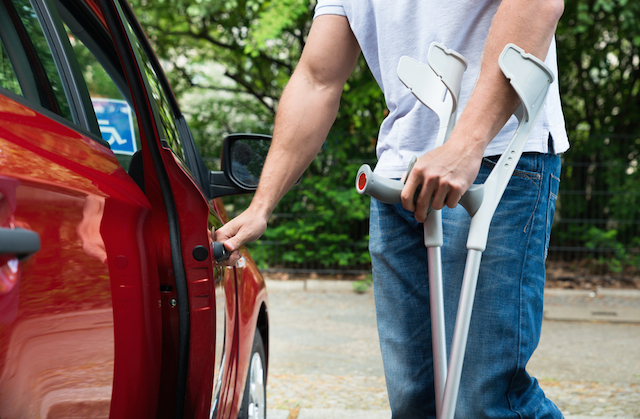 These are questions you will need to ask when comparing disabled driver car insurance. You will also need to check what the car insurance company's policy is in the event that no suitable replacement vehicle can be provided. Say, for example, they can provide a new car to replace your stolen one but it won't have the same modification you need. What can they offer instead? Can they allow a friend, relative or carer to be listed as a named driver to drive the car for you instead? Will they provide an allowance for taxis to help you get around in the interim period? Comparing car insurance policies is always a good idea, but you can also look to specialist disabled driver insurance companies, as they will often have more knowledge and experience of dealing with claims and applications. It is also worth checking out the Motability scheme if you haven't already done so. The Motability scheme is designed to help disabled drivers and those with severe mobility issues get around. It works by allowing people to exchange their government funded mobility allowance to lease a new car, scooter or powered wheelchair every three years. Usually this scheme also covers insurance, servicing and maintenance, as well as breakdown assistance. To help disabled drivers, Motability usually offer two named drivers on the insurance, meaning those who can't always drive themselves or carry out all their tasks independently can enlist a carer or family member to assist them. However, disabled drivers only qualify for the scheme if they get the higher rate of disability living allowance. They might also find difficulty in arranging the necessary modifications. Motability say they can carry out many types of modifications, but it cannot cater to every type of usability requirement. In such cases, you may need to pay for the modification yourself, but the insurance that comes with the deal may not always be able to cover that aspect. Always check the terms and conditions on your insurance policy whether it comes direct from an insurance company or via Motability. Some disabled drivers may opt for their own vehicle and car insurance policy because of a limitation imposed by the Motability scheme. For example, having your own car permanently might feel like a better deal than having to give up your car every three years (albeit for a new one). Also, having to install certain modifications each time might be tricky. If you can get a car insurance policy specifically for the car you want, and at the right price, that might be a better deal than going through Motability. Most importantly, be sure to look through all your options first.